On Thursday 20 November, Björn Ulvaeus attended a live music gala held at the United Nations General Assembly in New York, to mark the 25th anniversary of the Convention on the Rights of the Child – the most widely ratified legal agreement to protect children’s rights. During the high profile event, which included a performance by Yoko Ono and the launch of UNICEF’s ‘IMAGINE Project’, one of Sweden’s most popular young artists, Laleh, gave a unique rendition of ABBA’s Chiquitita. Joining her on stage afterwards, Björn made an impassioned speech, pledging ABBA’s long-term support to UNICEF (United Nations Childrens Fund) projects that specifically support the education, health and empowerment of girls. 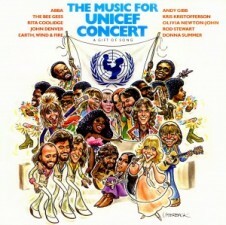 In his speech, Björn explained that the collaboration between ABBA and UNICEF had begun 35 years ago, when in January 1979 ABBA performed Chiquitita at the ‘Music for UNICEF’ concert and donated 50% of the song’s royalties to UNICEF. He said that as a result, Chiquitita had so far raised almost $4 million for children’s education and vaccination projects worldwide. “It’s as though the words are sung to all those sad, sad girls out there around the world today, who are suppressed one way or another and denied their rightful place in society. It’s as though the words say, “You deserve better. You deserve a chance. We want to help you. We want to give you education so that you can gain independence and stand up to those dark reactionary forces that want to tie you down. We want to empower you.” Björn said. “When we do that, not only are we helping them, but I think it is perhaps, the single most important thing we can do to make the world a more peaceful place,” he continued. “So that is why, from now on and into the future, 100% of the royalties to Chiquitita will go to help towards the promotion of rights for girls. Chiquitita means ‘little girl’ and we must never abandon the little girls,” Björn concluded. You can watch a video of the full gala. Björn and Laleh’s appearance is at approximately 11 minutes. Earlier in the week, ABBA The Museum and UNICEF Sweden unveiled a number of joint initiatives in support of the fundraising campaign, which they hope will help Chiquitita reach out to a new, younger audience. “ABBA built the Polar Studio in Stockholm in 1978 and the first song to be recorded there was Chiquitita. Parts of that studio have now been reconstructed at the museum with many of the original objects and instruments from the time. Each year, until 2019 when the song celebrates its 40th anniversary, we will invite well-known artists to record their own versions of Chiquitita in the museum’s Polar Studio. All the royalties from these new versions of the song will also go to UNICEF,” he said. The first to take up the challenge and record her interpretation of the ABBA ballad, as performed in New York, was Laleh. Agnetha Fältskog said she had enjoyed listening to Laleh’s recording: “In her own personal way, the very talented Laleh has given us a completely new Chiquitita, in a voice that expresses so many nuances – happiness, sorrow and everything in between. It is a fantastically imaginative arrangement that just draws you in,” she said. 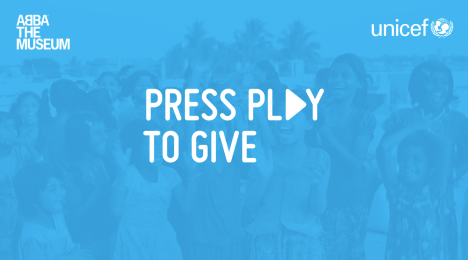 Another collaboration is the ‘Press Play To Give’ initiative which makes it easy to donate to UNICEF by simply playing Chiquitita on Spotify, iTunes or YouTube. “Our aim is to make donating easy, while spreading the word about children’s rights. We encourage more people to listen and donate by pressing play,” said Véronique Lönnerblad, Executive Director of UNICEF Sweden. To help bring ‘Press Play To Give’ to life, a new permanent side-exhibition about Chiquitita, through which visitors can donate, has been installed at ABBA The Museum. “As a visitor, you can choose to sing Chiquitita in one of the song booths or watch the music video. Every time you choose Chiquitita at the museum you will be contributing to UNICEF,” explained Mattias Hansson. “Our hope is that donating via music will become a natural part of everyday altruism all over the world,” he said.